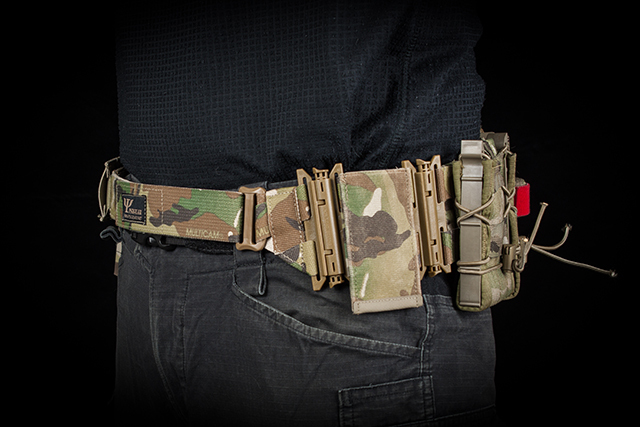 PSIGEAR® HMS (Hinge™ Modular System) is a modular system that has infinite possibilities for use.It can be applied in all gear with Hinge™ buckles, and several modulars themselves can form into a combat belt. Based on the design idea of modularity, quick switch between holster, magazine pouch, etc. are enabled by changing some modules. Even the angle of molle can be changed. It can also be easily disassembled and installed to other hinge modules. Hinge™ Quick Release Buckle can be quickly opened with one hand, the installation is also very convenient, it is narrower than the traditional buckle ,the distance between the two connected components is only 2cm, but the tension reaches 130lbs. The button position is fixed, convenient to find , the traditional pull rope quick release structure into the water is difficult to find the erratic pull rope, affects the speed of equipment release. Hinge™ buckle is very suitable for Plate Carrier main body and waist parts , and it is also suitable for interconnecting of Magazine Pouch, the holes in the buckle are designed for tactical gear, two 1 inch webbing can be fixed to any required position. The spring in the body of the main buckle is treated by electroplating , anti-acid corrosion and elasticity is not easy to attenuate.